The Miracle Match Foundation was established in January 1997 by tennis professional Bill Przybysz. 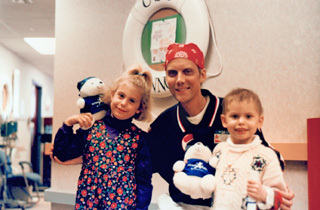 In July 1995 Bill was diagnosed with (AML) Acute Monocytic Leukemia. After going through a series of treatments in Grand Rapids, he was sent to the University of Michigan Medical Hospital for a bone marrow transplant, knowing that he may never play tennis again. Not only is he on his way to a complete recovery, but as a result was able to play his �Miracle Match� in February 1999 against John McEnroe.The Foundation has since dedicated itself to helping others play in their Miracle Match. No matter whether it is bedside or courtside, Bill and the Foundation are helping make winners out of them all. The Foundation�s vision is to help create Miracle Matches on their �field of play� for all individuals and their families challenged with stem cell related disorders through medical based facilities around the world. The Foundation�s mission is to develop a system utilizing various activities and other means to facilitate miracles for families throughout the world from simple smiles to total cures; initially focusing on cities where stem cell related centers are serving their regional areas. In 1997 the Foundation began our event-based funding with smaller projects in local communities with dinner galas, carnivals, tennis tournaments and clinics. In 1999 our national events were established with tennis exhibitions and our ice skating tours.